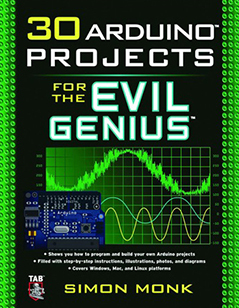 This book has 33 projects (not 30) that are useful for starters who have a fair knowledge of basic electronics and programming. Though the project may not satisfy very high end users, they surely cover more than the basics and the projects are really good to show off. The book focuses more on Uno and Leonardo boards. The best part of the book is that there is very little soldering practice for most of the projects except for a protoshield project, a binary clock and two or three projects on peripheral boards. One of the projects also covers the basics of a high end processing IDE, so on to provide a graphical displaying output. All the coding for each project is no more than 3 pages and is hence easy to understand. You can try each and every project without even knowing electronics beyond the basics of how to read a schematic and recognize specific components. Some of the useful projects include an LCD thermostat, a servo-controlled laser, infrared remote control circuit, lie detector, magnetic door lock and many more.